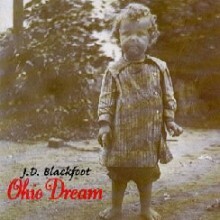 Ohio Dream was recorded at Rome Recording in Columbus, OH in 1997, and the title track “Ohio Dream” is the story of J.D.’s father’s life. This acoustic EP is composed of ballads that J.D. considered too soft for other albums and saved these songs for just such a project. The EP also contains the song “ Missing You In St. Louis,” a tribute to Vietnam veterans.